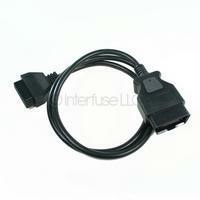 OBD2 Extension Cables can be used in applications for car and motor vehicle diagnostics. OBD2 extension cables come in a number of different lengths and styles in order to best suite your needs. You can use these cables to make viewing a diagnostic tool easier, extend the life of the OBD2 port on your diagnostic scanner and to extend the range of certain diagnostic tools. The most important use of the OBDII Extension Cable is to move the Female OBD2 port away from the driver’s foot area and gas pedals to a more convenient location and reduce obstruction. Common OBD2 Extension cable lengths are 1FT, 3FT, and 5FT. These extension cables may also have right angle or straight connections.